Are you ready for some food inspired silliness? 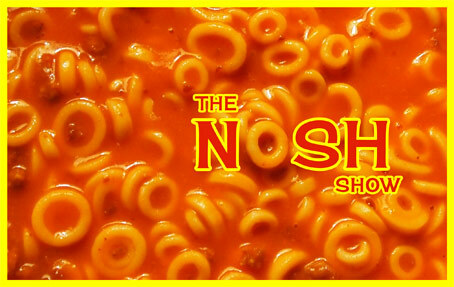 Episode 11 of The Nosh Show is now available! Head on over to The Nosh Show website to listen to see a complete rundown of everything we talked about. We got pretty silly in this episode as we mock everything from waffles to guitars (it'll make sense, don't worry). Instead of chew on this, we do a new segment where we all try the same food... hopefully at some point this segment will feature an ice cream! Hehehehe, or at least a candy bar! or cookies! or... ok, I'll stop. Please enjoy this latest episode and feel free to leave comments here or on the nosh show website. Now we all go food hunting between shows and in this case I decided to pick up a subway sandwich as part of our followup. Unfortunately, I bought the wrong sandwich. See I was suppose to get the enchilda melt, but instead I picked up the new Applewood Pulled Pork sandwich.... whoops. Now while I didn't get to talk about it on the show, thankfully it was a fairly tasty mistake (considering it came from subway). It's sweet, no real burn, and was eaten with minimal complaint. 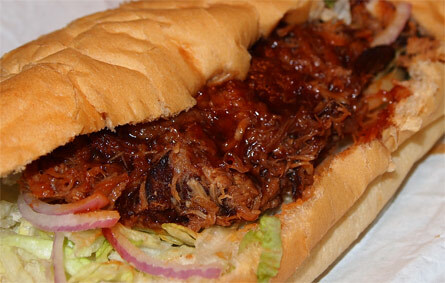 The only real problem I had with it was that the sub roll was no match for all the sauce they douse on the meat. 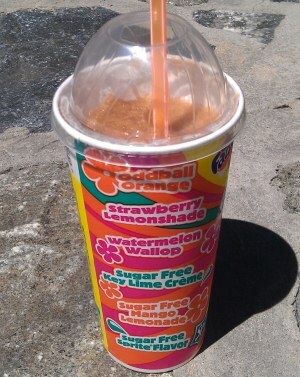 Oh geez, I totally forgot that I tried the 7/11 Strawberry Lemonshade Slurpee at the beginning of the month. August has been gorgeous around here and you know how that inspires me to walk down to 7/11. Now the coloring looks kind of scary, but for some reason I want to say this wasn't half bad.... I think... probably... why did I not jot down notes somewhere? Oy, ok, you guys want one more quick review? 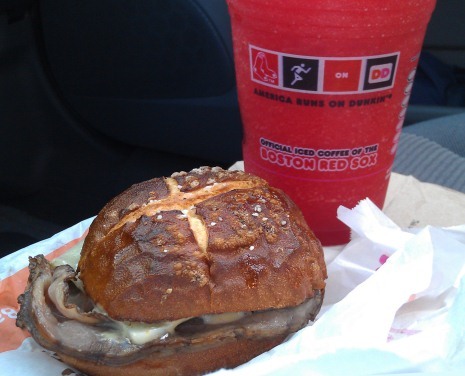 Ok, one more thing that didn't make it to the show was me trying the Dunkin Donuts Pretzel Roll Roast Beef Sandwich and the Strawberry Lemonade Coolatta. The roll works just fine here and overall the sandwich was actually quite tasty as it uses the same mustard from their ham & cheese roll sandwich that I like so much. Unfortunately the coolatta was pretty boring, there was way too much lemonade flavoring. I was hoping for a much more even balance. I really wanted a sweet kick, not just a kick. Oh well.